The 1960s was a decade of tremendous cultural and political change, so many of the old structures were either dismantled or ridiculed to a degree where no thinking person could take them seriously. For Capricorn Research the early part of the decade seems to have been spent largely in Sunday schools and church choirs, by the end of it my religious affiliations were strictly with Monty Python’s Flying Circus. So many of the scripts were learnt off by heart, much in the manner previously used for the Lord’s Prayer. Monty Python was a religion that would really stand the test of time, many of the sketches are still favourites and one that is still remembered warmly is that of the Piranha Brothers. ” Stig, I’ve been told Dinsdale Piranha nailed your head to the floor. No, no. Never, never. He was a smashing bloke. He used to give his mother flowers and that. He was like a brother to me. Oh yeah, well – he did that, yeah. Well he had to didn’t he ? I mean be fair there was nothing else he could do. I mean I had transgressed the unwritten law. What had you done ? ” One night Dinsdale walked in with a couple of big lads, one of whom was carrying a tactical nuclear missile. They said I’d bought one of their fruit machines and would I pay for it. How much did they want ? Three quarters of a million pounds. Then they went out. Why didn’t you call the police ? Well I noticed that the lad with the thermo nuclear device was the Chief Constable for the area. Anyway a week later they came back, said the cheque had bounced and I had to see Doug. Doug, I was terrified of him. Everyone was terrified of Doug. I’ve seen grown men pull their own heads off rather than see Doug. Even Dinsdale was frightened of Doug. By this combination of violence and sarcasm, Doug and Dinsdale controlled London. There was just one problem, Dinsdale was afraid of a gigantic imaginary hedgehog called Spiny Norman. Readers of this article with have to forgive the excessive religious devotion, but perhaps it helps to know that only the legendary Capricorn self control has prevented all the articles on this site being filled with Python quotes. Or maybe even worse, charts of all the series episodes. There can only be one planet that could do justice to such gangland villains in the criminal underworld. Pluto is conjunct the Sun and opposite the Moon in this chart. The Venus / Jupiter conjunction in Scorpio shows Doug and Dinsdale’s prominence in the East End. The stellium in Virgo includes a Mercury / Mars conjunction that nicely epitomises the rule by sarcasm and violence. If ever a chart feature symbolised someone being undermined by irrational and hallucinatory fears of something like Spiny Norman, it would have to be the Sun / Pluto opposite the Moon in Pisces. It’s a wonderful chart of cartoon villainy, but how would it compare to the real thing ? As a teenager at the time I do remember that much of the hilarity of the Piranhas was due to the fact that most of it was true and based on the notorious Kray Twins. Ronnie and Reggie Kray were the foremost perpetrators of organised crime in the East End of London during the 1950s and 60s. They were involved in armed robberies, arson, protection rackets, assaults, and murder. As West End nightclub owners, they mixed with prominent entertainers including Diana Dors, Frank Sinatra and Judy Garland, and with politicians. The Krays were much feared within their milieu, and became celebrities in their own right, even being interviewed on television. Reggie was the older twin, Ronnie, suspected to be a paranoid schizophrenic was born 10 minutes later. There’s no doubt the two harshest signs in the Zodiac are Scorpio and Capricorn and the Krays have the Sun and the Moon there. But the aspects are so severe. 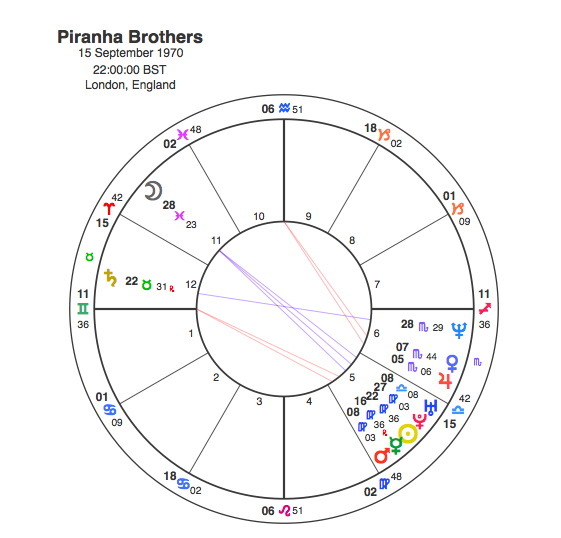 The Krays were born in 1933 and its fitting that they have the Uranus / Pluto square that triggered the Great Depression, but even more so as the Sun is opposite Uranus turning Pluto into the apex of a T Square. The Moon is also opposite Pluto which creates another T Square with Uranus as the apex planet. The Sun is square to the tough and austere Saturn. Mars is in Sagittarius in exact square to Neptune another planet whose difficult aspects are often a feature in charts of criminals. The Ascendant was Cancer, showing the local tribal nature of their image, and the fact that like the Piranha Brothers, they loved their mother. 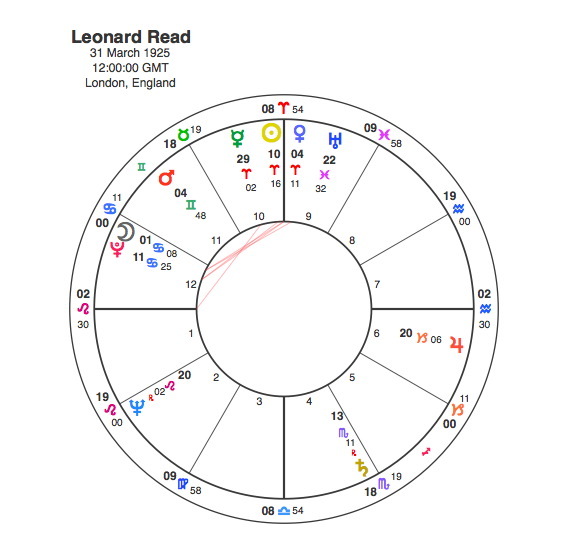 Its fascinating that as the Krays charts were so dominated by the Uranus / Pluto square, that they became such powerful even iconic figures during the mid 1960s when the two planets formed their famous conjunction. The chart speaks for itself and is far tougher than Doug or Dinsdale’s. But just as the Piranhas were closely pursued by detective Harry ” Snapper ” Organs, Ron and Reg were arrested by Detective Superintendent Leonard ” Nipper ” Read. Pluto through its ability to penetrate into the darker realms is often strong in the charts of detectives and Read also had the Sun in square to Pluto, with the Moon forming a conjunction as well. The Krays were arrested in May 1968, with the transiting Pluto sextile and Neptune conjunct their Mercury. You would think that would be the end of the story, but this would be forgetting the tremendous power of the transit of Pluto to conjunct the Sun which occurred for Ronnie and Reggie in 1985 when officials at Broadmoor Hospital discovered a business card of Ron’s, which prompted an investigation. It revealed the twins – incarcerated at separate institutions – plus their older brother, Charlie Kray and an accomplice not in prison, were operating a “lucrative bodyguard and ‘protection’ business for Hollywood stars”. Documentation of the investigation showed that Frank Sinatra hired 18 bodyguards from Krayleigh Enterprises during 1985. In October 2000, Reggie died with Pluto conjunct his Mars and square Neptune. In truth the portrayal of Dinsdale Piranha owed something to the reputation of the Krays greatest rivals, the Richardson gang from South London. The Richardsons’ alleged specialties included pulling teeth using pliers, cutting off toes using bolt cutters and nailing victims to the floor using 6-inch nails. The only birth details that are available for this gang are that of Charlie, the main leader. The Uranus / Pluto square is exact in Charlie’s chart and the Sun in Capricorn and Jupiter turn it into a vicious Grand Cross. He also has an exact Mars / Saturn conjunction. 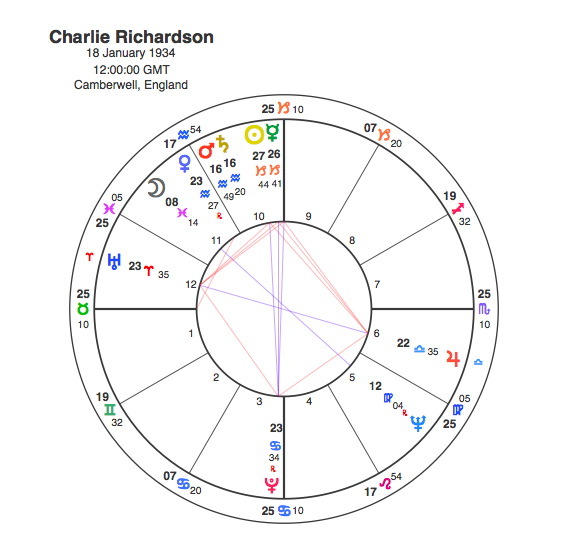 Perhaps the only reason why Charlie Richardson did not receive the same notoriety and celebrity status as the Krays was because of his Moon in Pisces in opposition to Neptune. But this could mean his villainous exploits had been kept in check by a paranoid fear of imaginary hedgehogs like Dinsdale. We will probably never know. Fascinating analysis. It would be interesting to understand why, with identical charts, only one of the Kray twins was insane, not both. The insane one was the youngest, so maybe family dynamics tipped him over the edge, but shouldn’t there be some sign in the birth chart? Thanks Alison,thats a wonderful question, and something that presents a challenge to astrology. I’ve heard many astrologers falling over themselves to use minor aspects of all kinds of things to the Ascendant to explain the difference in character between twins. Ronnie Kray was born a few minutes later and has 7 degrees 10 Cancer rising. Some could point to the fact that his Pluto was therefore 2 degrees closer to an opposition to the 8th house cusp as an explanation of his insanity. Personally I don’t think that kind of thing works. There are so many examples of twins that are different. My experience is that one twin will reflect the chart very strongly, whereas the other will often be a watered down version or something quite different altogether. Who knows why ? It maybe like you say to do with family dynamics, or perhaps one twin subconsciously but deliberately sets out to be different to the other one. All we can say for sure is that between the two of them, the symbolism of the chart will be expressed. Many thanks, that’s a most interesting insight that twins will cover all the potential of the birth chart between them, but not necessarily in its entirety as individuals. Thanks Alison. Its not a view I’m sure of at all, but it does seem to keep our options open.